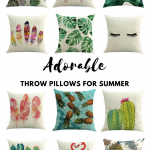 Today’s blog post literally screams summer! This super adorable cold shoulder bow tie top is super lightweight and perf for the hotter months! 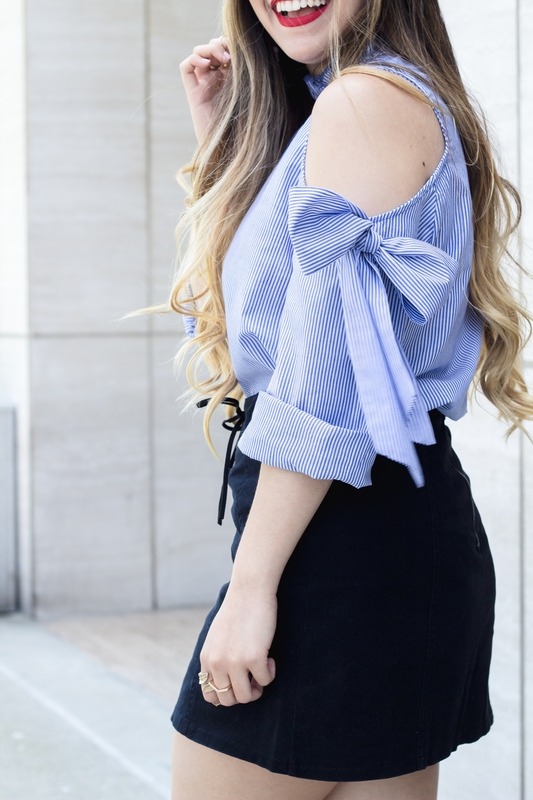 It’s long sleeve and has a button down shirt like material, so I decided to roll up the sleeves of this cold shoulder bow tie top to give it that cuter vibe! My super adorable cold shoulder bow tie top is only $16! For reference, I’m wearing a small! My lace-up denim mini skirt is under $18 and also comes in white and mauve pink! For reference, I’m wearing a medium but could have sized down to a small! 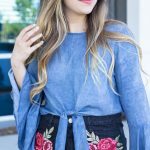 And now for the $1000 Nordstrom giveaway! I’ve partnered with some of my fabulous blogger babes to give one of our lucky readers a $1000 Nordstrom gift card! It’s super easy to enter and it’s our way of saying thank you for being SO marblelous!!!! 💋 To enter, please use the widget below. How cute are you?! What a fun summer look! I love your bag!